Make your own fabulous chair & removable cover for about $25. 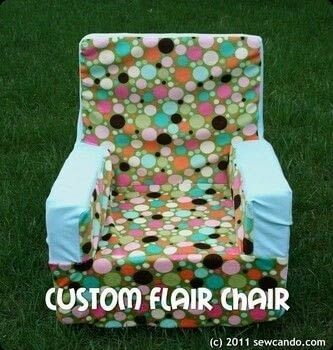 It's the Choose Your Flair Custo Foam Chair! Make it soft & cuddly, use fun prints or personalize it. Anything to give it your own look. 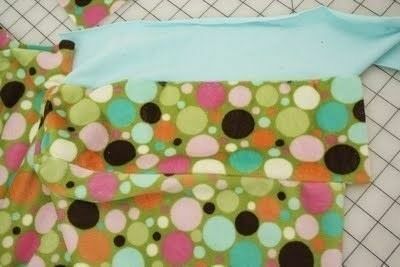 1 yd stretch knit Fabric (60" wide). Interlock, French Terry, Minky, Fleece, etc. ~or~ Two 1/2 - 3/4yds of stretch knit (how much depends on which parts of the cover are which fabric) 32" long piece of 1/4"wide Elastic Ball point Needle Yard Stick , marking pen, shears/rotary cutter Optional, but recommended: roll of Paper to scale up my pattern info into full size pattern pieces (this keeps things as simple & easy as possible and then you can use it over & over). Using the yard stick & pen, measure and mark the cut lines for making the back, arms & seat as shown. Carefully & slowly cut through the thickness with the knife. 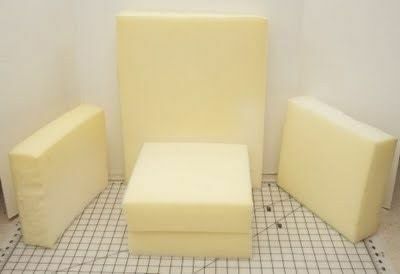 Stack the two seat pieces and put an arm piece on either side and place the back behind them all. Glue the pieces together. Foam can be tricky to adhere, but it's ok if it doesn't stick, because the cover will keep it all together anyway. 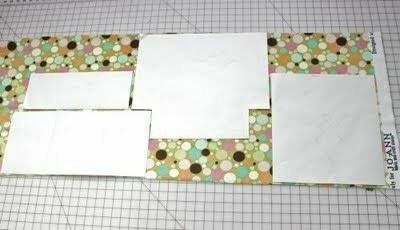 Lay out the pattern pieces on the fabric(s) as needed, making sure all pieces have the stretch of the fabric going horizontally. 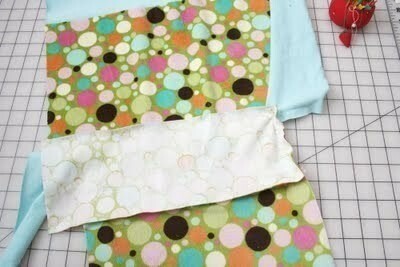 Cut pieces out of fabric and either mark the pieces or leave the patterns attached, so it's easy to fit everything together. 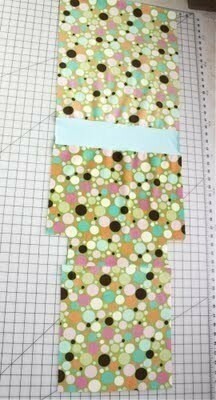 with right sides facing, stitch together one long side of the top piece to back piece with a 1/2" seam allowance. 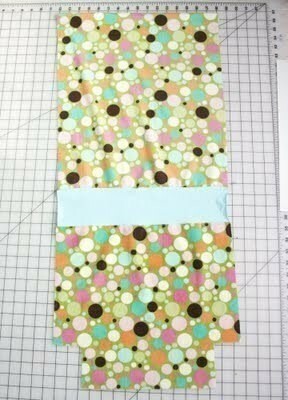 Stitch the other long side of the top piece to the chair front so it looks like this. Then stitch the chair front (end with the cut outs) to the seat. Now to attach the arms. 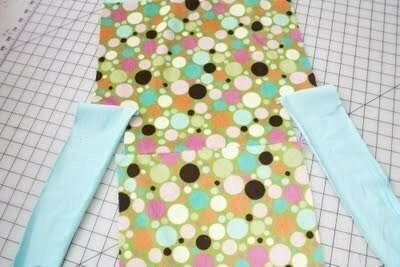 With right sides facing, stitch the arm pieces to the chair face so they will look like this. Flip the arms out of the way and attach the inner side pieces to the other section of the chair front just under the arms on each side. 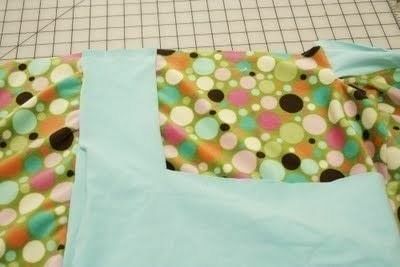 With right sides facing, stitch together the upper part of the inner side to the arms so they look like this. Do the same along the short sides of those pieces to create the front corner of the arms. The cover is nearly done! 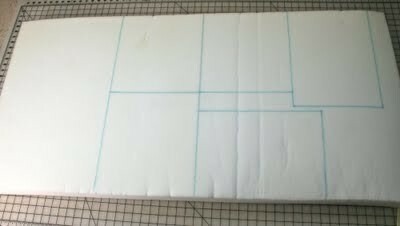 To add the chair sides on, with right sides facing, stitch the short end of the "L" shaped panel to the top section of the cover. Stitch the back of the "L" to the back section of the chair and the stitch the remaining angles to the chair front, arm and front. 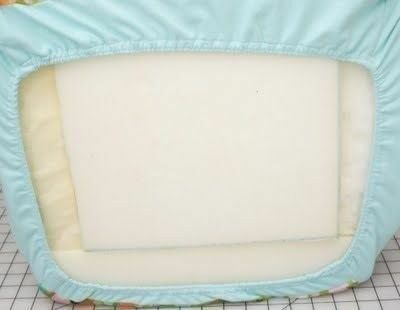 Now this is where to add the elastic so it will stay on nicely on the bottom & be easy to remove. Stitch on the 1/4" elastic about 3/4" from the raw edge. 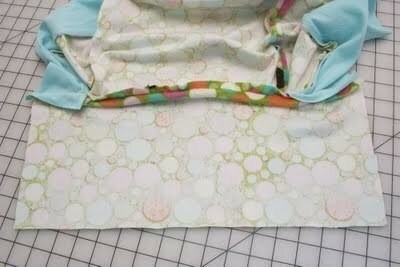 Pull the elastic taut as you sew it on, so it will cinch up. 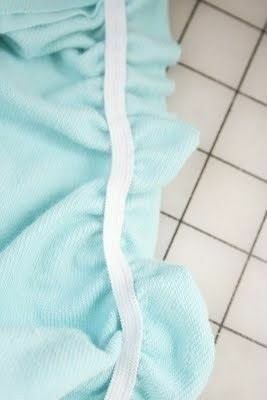 Sew it on all the way around. Then fold the raw edge over the elastic to make a hem and stitch it in place on the right side of the fabric 1/2" in from the edge. 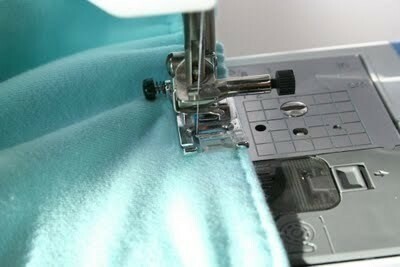 Again, pull the fabric taut as you stitch and make sure to not to catch the elastic when sewing the seam. Slip the cover over the foam, fitting the fabric around all the corners & smoothing into place.